How can a board of trustees of an association looking for a firm to provide community management services for their community easily narrow down the field of potential candidates? Furthermore, there are many companies to choose from. So, how do boards distinguish those companies who have truly demonstrated their integrity, professionalism, experience and expertise? There are two designations that management companies can earn. These designations let prospective clients know that they possess those qualities which are essential for community association operations. These two designations are The Accredited Management Organization® and the Accredited Association Management Company®. Maintain appropriate insurance coverage to ensure financial stability and to protect their client’s funds. Pass an independent financial review. Have a Certified Property Manager® (CPM) member in an executive position to supervise management operations. Meet specific standards and required functions for operations of the firm, servicing the client, and managing the properties. Promise to abide by the AMO Code of Professional Ethics. A minimum of three years’ experience providing community association services, based on client verification. A Professional Community Association Manager® (PCAM) designee as the company’s senior manager. A staff of which 50% of managers who have been with the company for at least two years hold a CAI/CAMICB credential (PCAM, LSM, AMS, and CMCA). Maintain fidelity, general liability, and workers compensation insurance in addition to meeting federal, state and local laws. A Certificate of Insurance Liability showing the required insurance must be included with the application which lists CAI HQ as the Certificate Holder. Why are the requirements of these two designations so important to board members who are considering engaging a management company? The answer is fiduciary duty. Board members have an obligation to their communities called fiduciary duty. Accordingly, the expectations of that duty are to make decisions to protect and/or enhance the assets of the person or entity to whom they owe the fiduciary duty. Most importantly, hiring an AMO® or an AAMC® company to provide management services for a community, fulfills that obligation. 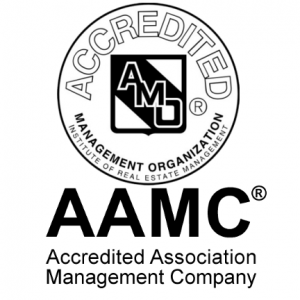 Finally, homeowners can rest assured that the management company holding both the AMO® and the AAMC® designations, is among the very best. Selecting a company, like Access Property Management, with these credentials, is the right choice for handling the operations of their community, and a move in the right direction to protecting one of their most valuable assets. Posted September 25, 2018 & filed under Resources.